Oh no! CJ and Edison are locked out and it’s up to the 2nd graders to help them get in. ‘Locked Out’ is a cool rhyming words worksheet to teach your kids about rhyming words. 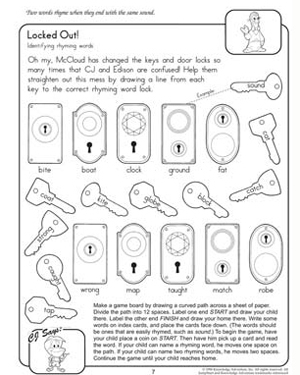 In this English worksheet, the little ones need to help CJ and Edison figure out which key belongs to which lock by matching the rhyming words. Give them this reading worksheet to solve and your 2nd graders will soon be poets in the making!